Two Swedish satellites performed a precision waltz in orbit last week, coming tantalizingly close to one another at one point, and catching it all in a video. Mango and Tango are part of the Prisma mission, a series of various demonstrations run by the Swedish Space Corp. They had been bolted together when they launched into orbit June 15. They separated to begin their space rendezvous mission in mid-August. Zooming through space at about 17,500 mph (28,164 kph), the satellites have been testing autonomous rendezvous technology from Sweden, a GPS system from Germany, a radio frequency instrument from France and a navigation sensor from Denmark. SSC officials have said the mission is aimed at testing technologies that could be used for future orbital repairs, automatic docking and scientific missions that bring together multiple satellites to form a massive telescope to study distant stars. 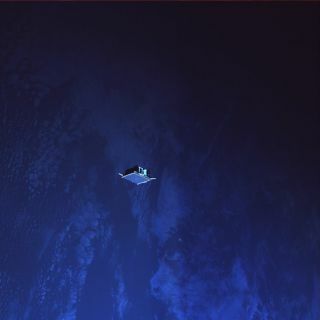 Satellite rendezvous tests also have been conducted in the United States by NASA and the Defense Advanced Research Projects Agency, which led the Orbital Express mission in 2007 that successfully demonstrated autonomous docking, satellite refueling and maintenance techniques. Over the next six months or so, Mango — a 331-pound (150-kg) craft about the size of a kitchen stove — will continue to perform a sort of dance with the smaller Tango. Mango will try to stay cheek-to-cheek with Tango, demonstrating each of the technologies. These new technologies can theoretically control the satellites' positions very precisely. Engineers plan to bring Mango and Tango to within just a meter of each other, or about three feet, at some point during the mission, according to SSC officials. Prisma is also testing out another new technology — a more environmentally friendly thruster system. The High Performance Green Propulsion (HPGP) system, which serves as a backup on Mango, uses a propellant based on ammonium dinitramide. The nontoxic fuel is more environmentally friendly than the hydrazine propellant typically used on satellites, SSC officials said. The "green" thruster system passed a key test in August, receiving the thumbs-up for further use in space. Mango sports six traditional hydrazine engines, which shoulder the main propulsion load. The test results showed the experimental system can step in if needed, according to SSC officials. The in-space tests validated theory and extensive ground testing, which both suggested the HPGP system would provide more power and better efficiency than hydrazine engines, SSC officials said.